Saturday. National Harbor. Need we say more? 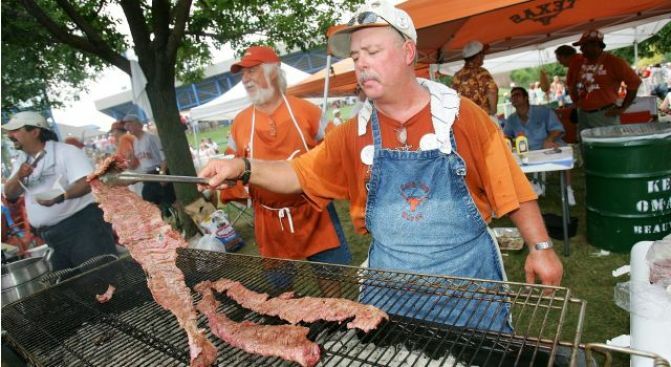 The Beer, Bourbon and BBQ Festival should be something like this, but with some beer and some bourbon. And then multiply that image by 1,000. Lookin' to get a little hog crazy this weekend? Throw on your jorts and head to every man's fantasyland: the Beer, Bourbon and BBQ Festival. Yes, for one day only, it will be semi-acceptable to dress like a hillbilly in the fancy-pants National Harbor, stuff your face with barbecue, sample all the beer and bourbon you like (within the realm good judgment, we'd hope), listen to live music all day, and maybe even ride the mechanical bull. Hmm, things may or may not get out of hand. The VIP tasting tickets are sold out, but you can still purchase regular tasting tickets -- just make sure to get them before they sell out, too. For $30 in advance (or $35 at the door), you'll receive a sampling glass to use at all the bars from 2 to 6p.m. Designated drivers get in for only $20. Now, let's break this baby down. Beer: There will be 60 (yes, 60) different types of beer to sample. They have added 50 percent more bars and stations than last year, which means more beer, fewer lines and happier drinkers. Bourbon: Unfortunately, there are fewer bourbon options to choose from (man, only 40), but thankfully this stuff packs at least twice the punch. Expect the typical trio of Beam, Daniels and Williams, but maybe it's time to expand that bourbon palate of yours. 'Cue: After all the alcohol, you know you'll be cravin' something to fill that empty tummy. Fortunately, you will have your pick of barbecued beef, pork, chicken and more, with of course, all the typical fixin's of coleslaw, corn on the cob, hushpuppies and beans. Oh, speakin' of beans, you can enter the World BBQ Bean-Eating Championship, but just don't expect your friends to hang out with you afterwards. They don't call beans "the magical fruit" for nothin'.